The Honda Ridgeline’s coil spring rear suspension strikes a balance between pleasure and impressive utility. 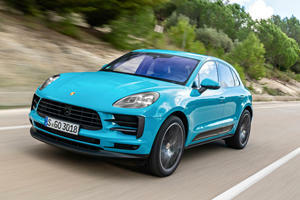 The only engine option, a 3.5-liter V6 packing 280hp and 162lb-ft only offers a 6-speed automatic, with the option of front- or all-wheel drive, but limited tow capacity. A Black Edition model adds all-black 18in wheels, blacked out styling, and red interior accents, but with no changes in performance. Safety tech is impressive – an IIHS Top Safety Pick + offering emergency auto braking, road departure mitigation, and forward collision warning. When playing the game of spot the odd one out in the mid-sized pickup segment, the Honda Ridgeline sticks out like a sore thumb. It’s not the styling, but rather the construction and drivetrains that set it apart. See, the Ridgeline is a lifestyle truck – built using a unibody frame that shares much of its core with the previous Odyssey van. The engine is mounted transversely, and as such the Ridgeline is the only pickup to be offered in front-wheel drive guise; at least in base specification. Can a truck based on a van really be competitive? If ever the humble van and SUV origins would prove worthwhile, you’d imagine it would be in the interior. For the most part it follows through. Offered only in crew-cab body style, there’s more than ample room for rear passengers, and the flip up rear seat reveals copious amounts of storage. 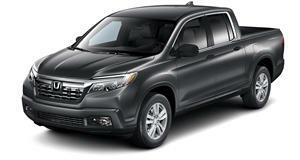 The Ridgeline features some of the highest quality interior materials in segment and is loaded with features. Cruise control and a reverse camera are standard even on the base RT trim level, and a tilt and telescopic steering wheel makes it easy to get comfortable. Start specifying higher trim levels and you get luxuries like tri-zone climate control, a heated leather steering wheel, and heated power-adjustable seats. The biggest problem with the interior though must be the touch screen system – devoid of knobs and buttons it makes even adjusting volume problematic while driving. For toys and interior comforts, none of the Ridgeline’s rivals come close. If the Chevrolet Colorado’s ride is car-like, then the Ridgeline is downright luxurious. The perks of being based on a van mean comfort is placed as a big priority in early development. The independent coil spring rear suspension is far more comfortable than rivals with a solid rear axle and leaf-sprung setup – small bumps are nearly unnoticeable. Body roll is also kept to a minimum, and riding on 18-inch wheels across the range the Ridgeline feels very competent in all scenarios. Front end grip is ample, and even when the going gets rough the Ridgeline feels competently pinned to the road. It feels smaller on the road than its size suggests, and the electrically assisted steering’s ample weight feels seriously refined. It’s almost easy to forget you’ve got a 64-inch cargo bed behind you, as the Ridgeline feels like a comfortable family SUV more than anything else. Unlike other competitors offering multiple engines, the Ridgeline makes do with a single 3.5-liter gasoline V6, with only a 6-speed automatic to do the shift-work. The V6’s outputs are healthily on par for class average, with 280 horsepower and 162lb-ft of torque, but towing capacity is a bit low at 3500- and 5000lbs for 2WD and 4WD models respectively. Performance from the big-6 is surprisingly punchy, though the gearbox can be a bit slow to downshift without a serious punch of the gas pedal. 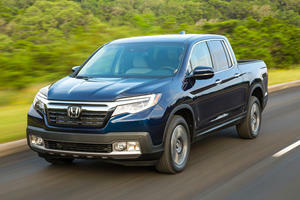 Notably, the Ridgeline’s fuel economy figures trump the competition with a 19/26 mpg EPA city/highway rating for the FWD variants, while AWD models only sacrifice 1 mpg on both fronts. Much like a mullet, the Ridgeline is a serious affair of party-in-the-back. The two-way operational tailgate makes it easy to offload the cargo bed, while the 7-cubic-foot under bed trunk is watertight from above, and has a drainage plug underneath – mobile cooler anyone? RTL-E and Black Edition models even vibrate the cargo bed turning it into a big speaker. But the bed’s capacity is limited at only 64-inches with no longer option, although 50-inches between the wheel wells helps. Safety is amongst the highest in class, with adaptive cruise control, forward collision assist and auto-emergency braking to name a few, making it an IIHS Top Safety Pick + and a 5-star NHTSA rating. Despite being limited to crew-cab and short cargo box configuration only, the Ridgeline simply owns the segment when it comes to offering high levels of equipment and exceptional safety. The car-like build and ride quality mean that the lifestyle truck is the easiest to live with. The RTL-T trim at $36 080 is our pick for the generous specification. 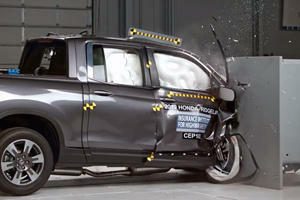 Over 100,000 vehicles are potentially affected.